With Russian & Iranian forces now engaged in combat in Syria, people are asking, “What is the War of Gog & Magog?” Here’s the answer, Part One. Keep your eyes open, but don’t jump to conclusions. These are not times to fear, but exciting times, as we see the things spoken of in the Bible unfolding before our very eyes. 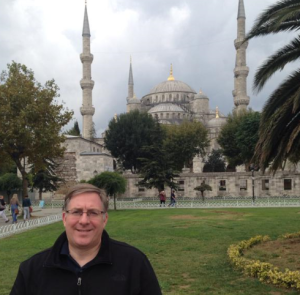 Standing in front of the famed Blue Mosque in Istanbul, Turkey. Is there any significance to these developments in light of Bible prophecy? Do these events have anything to do with the prophecies found in Ezekiel 38 & 39? Are recent events setting the stage for the fulfillment of what Bible scholars call the “War of Gog & Magog” that is supposed to take place in the End of Days? This entry was posted on October 10, 2015 at 7:03 pm and is filed under Uncategorized. You can follow any responses to this entry through the RSS 2.0 feed. You can leave a response, or trackback from your own site.